Mother of victim "sick, depressed, outraged, heartbroken"
(CNN) -- Victims' family members and advocates are grieving anew as the only man convicted in the 1988 bombing of Pan Am Flight 103 over Lockerbie, Scotland -- which killed 270 people -- was released Thursday from a British prison. 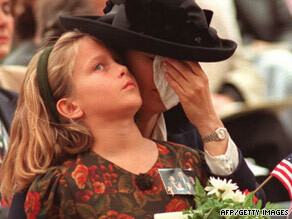 Victoria Cummock holds daughter Ashley during a 1995 memorial service. John Cummock died in the bombing. Abdelbeset Ali Mohmed al Megrahi, 57, sick with advanced prostate cancer, was released on compassionate grounds and sent home to Libya to die, Scottish authorities said. Megrahi, who prosecutors said was a Libyan intelligence agent, was convicted in 2001 of placing a bomb on the Boeing 747. Libya has formally accepted responsibility for the bombing and has compensated the families, although longtime Libyan leader Moammar Gadhafi denied any culpability in the attack. Cohen and others said international politics had trumped justice as U.S. and British relations with Gadhafi have thawed over the years. "I thought that our governments, both the U.S. and the U.K., owed it to the victims and their families to ensure that Megrahi would fulfill his sentence," said Victoria Cummock, whose husband, John, died in the attack. "If he did the crime, he should do the time. ... (But) when you try to combine politics with justice, politics always wins." "I expected this," said Mark Zaid, a Washington-based lawyer for several victims' families. "I work with governments all the time, and governments do not act to protect the interests of the people, they act to protect the interests of the country. And those are different." Zaid said he might file a lawsuit under the U.S. Freedom of Information Act to learn what the governments promised each other to accomplish Megrahi's release. It especially galls the families that Megrahi's release was on compassionate grounds. Added Cummock: "I think it's unconscionable that he would have the audacity to apply on compassionate grounds to be released and that they would actually consider it. Nevertheless, not only did they consider it, they granted it. "I think it's a huge disservice, not only to the families but also for the people of Lockerbie and everybody that was left to pick up the pieces over the years -- all of the prosecutors, the investigators and so on," she said. Zaid said his clients consider the decision "a slap in the face." "He showed no compassion to the victims, and he's lived two decades more than any of their loved ones have," he said. Interest in long-out-of-reach Libyan oil dictated the decision, Zaid said. "This is now catch-up time, and there's a lot of money to be made," he said. They'll come to regret it, Cummock predicted. "It sends an awful message out to those who want to use violence or terrorism to affect U.S. policy," she said. The families didn't need this wound to be reopened, Zaid said. "A lot of them have moved on," he said. "The loss is never going to go away, but it doesn't help the situation to have their feelings played like political pawns as part of this international game." But not all victims' families shared the outrage. Caroline Stevenson, whose son, Syracuse student Sandy Phillips, was aboard Pan Am 103, told CNN affiliate KARK in Little Rock, Arkansas, that she is "not disturbed" by al-Megrahi's release. "Whether he's in jail or whether he's with his family, it doesn't impact me," she said. "He should be able to be with his family and die in peace. And I hope he has found some peace." "I am not disturbed by it. I feel like if he is dying of prostate cancer, I don't have any problems at all with him being able to be with his family as he dies." Stevenson added that she doesn't understand the U.S. government's opposition to al-Megrahi's release. "I strongly believe in the Scottish Judical system, and I support their decision," she said. "The people of Scotland have been very good to me and my family."